Tissue/ cell preparation (Human). Fibroblast cells (HT1080). ICC/IF: HEK293, HeLa cells. Flow cytometry: HEK293, MCF7 cells. This monoclonal antibody to integrin beta 1 has been knockout validated in ICC/IF and flow cytometry. The expected signal was observed in wild type cells and no signal was seen in knockout cells. This antibody inhibits the function of beta 1 integrins and can be used to block cell adhesion (Dittell et al., 1993 and Yokosaki et al., 1994). This antibody inhibits the function of all beta 1 Integrins. Our Abpromise guarantee covers the use of ab24693 in the following tested applications. WB 1/1000. Predicted molecular weight: 88 kDa. Integrins alpha-1/beta-1, alpha-2/beta-1, alpha-10/beta-1 and alpha-11/beta-1 are receptors for collagen. Integrins alpha-1/beta-1 and alpha-2/beta-2 recognize the proline-hydroxylated sequence G-F-P-G-E-R in collagen. Integrins alpha-2/beta-1, alpha-3/beta-1, alpha-4/beta-1, alpha-5/beta-1, alpha-8/beta-1, alpha-10/beta-1, alpha-11/beta-1 and alpha-V/beta-1 are receptors for fibronectin. Alpha-4/beta-1 recognizes one or more domains within the alternatively spliced CS-1 and CS-5 regions of fibronectin. Integrin alpha-5/beta-1 is a receptor for fibrinogen. Integrin alpha-1/beta-1, alpha-2/beta-1, alpha-6/beta-1 and alpha-7/beta-1 are receptors for lamimin. Integrin alpha-4/beta-1 is a receptor for VCAM1. It recognizes the sequence Q-I-D-S in VCAM1. Integrin alpha-9/beta-1 is a receptor for VCAM1, cytotactin and osteopontin. It recognizes the sequence A-E-I-D-G-I-E-L in cytotactin. Integrin alpha-3/beta-1 is a receptor for epiligrin, thrombospondin and CSPG4. Alpha-3/beta-1 may mediate with LGALS3 the stimulation by CSPG4 of endothelial cells migration. Integrin alpha-V/beta-1 is a receptor for vitronectin. Beta-1 integrins recognize the sequence R-G-D in a wide array of ligands. Isoform 2 interferes with isoform 1 resulting in a dominant negative effect on cell adhesion and migration (in vitro). When associated with alpha-7/beta-1 integrin, regulates cell adhesion and laminin matrix deposition. Involved in promoting endothelial cell motility and angiogenesis. Involved in osteoblast compaction through the fibronectin fibrillogenesis cell-mediated matrix assembly process and the formation of mineralized bone nodules. May be involved in up-regulation of the activity of kinases such as PKC via binding to KRT1. Together with KRT1 and RACK1, serves as a platform for SRC activation or inactivation. Plays a mechanistic adhesive role during telophase, required for the successful completion of cytokinesis. Integrin alpha-3/beta-1 provides a docking site for FAP (seprase) at invadopodia plasma membranes in a collagen-dependent manner and hence may participate in the adhesion, formation of invadopodia and matrix degradation processes, promoting cell invasion. ITGA4:ITGB1 binds to fractalkine (CX3CL1) and may act as its coreceptor in CX3CR1-dependent fractalkine signaling (PubMed:23125415, PubMed:24789099). ITGA4:ITGB1 and ITGA5:ITGB1 bind to PLA2G2A via a site (site 2) which is distinct from the classical ligand-binding site (site 1) and this induces integrin conformational changes and enhanced ligand binding to site 1 (PubMed:18635536, PubMed:25398877). ITGA5:ITGB1 acts as a receptor for fibrillin-1 (FBN1) and mediates R-G-D-dependent cell adhesion to FBN1 (PubMed:12807887, PubMed:17158881). Isoform 5: Isoform 5 displaces isoform 1 in striated muscles. (Microbial infection) Integrin ITGA2:ITGB1 acts as a receptor for human echoviruses 1 and 8 (PubMed:8411387). Acts as a receptor for cytomegalovirus/HHV-5 (PubMed:20660204). Acts as a receptor for Epstein-Barr virus/HHV-4 (PubMed:17945327). Integrin ITGA5:ITGB1 acts as a receptor for human parvovirus B19 (PubMed:12907437). Integrin ITGA2:ITGB1 acts as a receptor for human rotavirus (PubMed:12941907). Acts as a receptor for mammalian reovirus (PubMed:16501085). In case of HIV-1 infection, integrin ITGA5:ITGB1 binding to extracellular viral Tat protein seems to enhance angiogenesis in Kaposi's sarcoma lesions (PubMed:10397733). Isoform 1 is widely expressed, other isoforms are generally coexpressed with a more restricted distribution. Isoform 2 is expressed in skin, liver, skeletal muscle, cardiac muscle, placenta, umbilical vein endothelial cells, neuroblastoma cells, lymphoma cells, hepatoma cells and astrocytoma cells. Isoform 3 and isoform 4 are expressed in muscle, kidney, liver, placenta, cervical epithelium, umbilical vein endothelial cells, fibroblast cells, embryonal kidney cells, platelets and several blood cell lines. Isoform 4, rather than isoform 3, is selectively expressed in peripheral T-cells. Isoform 3 is expressed in non-proliferating and differentiated prostate gland epithelial cells and in platelets, on the surface of erythroleukemia cells and in various hematopoietic cell lines. Isoform 5 is expressed specifically in striated muscle (skeletal and cardiac muscle). The cysteine residues are involved in intrachain disulfide bonds. Cell membrane, sarcolemma. Cell junction. In cardiac muscle, isoform 5 is found in costameres and intercalated disks and Cell membrane. Cell projection, invadopodium membrane. Cell projection, ruffle membrane. Recycling endosome. Melanosome. Cleavage furrow. Cell projection, lamellipodium. Cell projection, ruffle. Cell junction, focal adhesion. Cell surface. Isoform 2 does not localize to focal adhesions. Highly enriched in stage I melanosomes. Located on plasma membrane of neuroblastoma NMB7 cells. In a lung cancer cell line, in prometaphase and metaphase, localizes diffusely at the membrane and in a few intracellular vesicles. In early telophase, detected mainly on the matrix-facing side of the cells. By mid-telophase, concentrated to the ingressing cleavage furrow, mainly to the basal side of the furrow. In late telophase, concentrated to the extending protrusions formed at the opposite ends of the spreading daughter cells, in vesicles at the base of the lamellipodia formed by the separating daughter cells. Colocalizes with ITGB1BP1 and metastatic suppressor protein NME2 at the edge or peripheral ruffles and lamellipodia during the early stages of cell spreading on fibronectin or collagen. Translocates from peripheral focal adhesions sites to fibrillar adhesions in a ITGB1BP1-dependent manner. Enriched preferentially at invadopodia, cell membrane protrusions that correspond to sites of cell invasion, in a collagen-dependent manner. Localized at plasma and ruffle membranes in a collagen-independent manner. ab24693 staining Integrin beta 1 in wild-type HAP1 cells (top panel) and Integrin beta 1 knockout HAP1 cells (bottom panel). The cells were fixed with 4% formaldehyde (10min), permeabilized with 0.1% Triton X-100 for 5 minutes and then blocked with 1% BSA/10% normal goat serum/0.3M glycine in 0.1% PBS-Tween for 1h. The cells were then incubated with ab24693 at 5μg/ml concentration and ab202272 at 1/250 dilution (shown in pseudo colour red) overnight at +4°C, followed by a further incubation at room temperature for 1h with a goat secondary antibody to Mouse IgG (Alexa Fluor® 488) (ab150117) at 2 μg/ml (shown in green). Nuclear DNA was labelled in blue with DAPI. Overlay histogram showing HAP1 wildtype (green line) and HAP1-ITGB1 knockout cells (red line) stained with ab24693. Live HAP1 wildtype and HAP1-ITGB1 knockout cells were incubated in 1x PBS / 10% normal goat serum to block non-specific protein-protein interactions followed by the antibody (ab24693, 0.1µg/0.5x106 cells) for 30 min at 22°C. A mouse IgG1 isotype control antibody (ab170190) was used at the same concentration and conditions as the primary antibody (HAP1 wildtype - black line, HAP1-ITGB1 knockout - grey line). Unlabelled sample was also used as a control (this line is not shown for the purpose of simplicity). Acquisition of >5,000 events were collected using a 50 mW Blue laser (488nm) and 530/30 bandpass filter. Immunocytochemistry/ Immunofluorescence - Anti-Integrin beta 1 antibody [P5D2] (ab24693)Image from Modulevsky DJ et al., PLoS One. 2012;7(9):e45329. Fig 7.; doi: 10.1371/journal.pone.0045329. Cells were exposed to inhibitors for 60 min and then fixed and stained for the presence of β1-integrin (greyscale and red in the merge) and the plasma membrane (green in the merge). LSCM images were acquired at the cell-substrate interface. (A) Control (scale bar = 20 µm and applies to all), (B) Cyt-D, (C) nocodazole, (D) Y-27632A, (E) ML-7 and (F) blebbistatin treated cells. In all cases, integrin-ß1 is well distributed over the cell contact area. However, after 60 min of CytD treatment a significant decrease in integrin-ß1 was observed, correlating to a significant decrease in cell adhesion strength (Fig. 5). Cells were first fixed by parafromaldehyde and subsequently extracted by methanol. ab24693 and Alexa Fluor 546 rabbit anti-mouse immunoglobin were used as primary and secondary antibodies, respectively. Cells were also stained with wheat germ agglutinin coupled to Oregon Green 488 to reveal the cell membrane. Overlay histogram showing MCF7 cells stained with ab24693 (red line). The cells were fixed with 4% paraformaldehyde (10 min) and then permeabilized with 0.1% PBS-Tween for 20 min. The cells were then incubated in 1x PBS / 10% normal goat serum / 0.3M glycine to block non-specific protein-protein interactions followed by the antibody (ab24693, 1µg/1x106 cells) for 30 min at 22ºC. The secondary antibody used was a goat anti-mouse DyLight® 488 (IgG; H+L) (ab96879) at 1/500 dilution for 30 min at 22ºC. Isotype control antibody (black line) was mouse IgG1 [ICIGG1] (ab91353, 2µg/1x106 cells) used under the same conditions. Acquisition of >5,000 events was performed. This antibody gave a positive signal in MCF7 cells fixed with 80% methanol (5 min)/permeabilized with 0.1% PBS-Tween for 20 min used under the same conditions. Immunocytochemistry/ Immunofluorescence - Anti-Integrin beta 1 antibody [P5D2] (ab24693)This image is courtesy of an anonymous abreview. 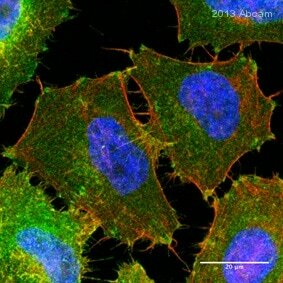 ICC/IF image of ab24693 stained HeLa cells. The cells were formaldehyde fixed, permeabilization with 0.5% TritonX/PBS and then blockedwith 5% BSA for 30 minutes at 21°C. The cells were then incubated with the antibody (ab24693, 1/200) for 1 hour at 21°C. The secondary antibody (green) was Alexa Fluor® 488 goat anti-mouse IgG (H+L) used at a 1/500 dilution. DAPI was used to stain the cell nuclei (blue) and Phalloidin-TRITC (red) the actin cytoskeleton. Immunocytochemistry/ Immunofluorescence - Anti-Integrin beta 1 antibody [P5D2] (ab24693)Image from Molladavoodi S et al., PLoS One. 2017;12(6):e0178981. Fig 8.; doi: 10.1371/journal.pone.0178981. Higher intensity for integrin β1 staining can be observed in the low shear sample compared to no shear. a) Control (no shear) sample, b) After 24 hours of low shear stress exposure. Control cells and cells exposed to low shear for 24-hr were fixed with 4% paraformaldehyde. Samples were permeabilized with 0.1% Triton and nonspecific binding was blocked with 1% BSA/10% goat serum. Samples were incubated with ab24693 followed by Alexa Fluor® 488 conjugated secondary antibody (ab150113). Immunohistochemistry (Formalin/PFA-fixed paraffin-embedded sections) - Anti-Integrin beta 1 antibody [P5D2] (ab24693)Image from Yuan X et al., PLoS One. 2014;9(4):e94212. Fig 2.; doi: 10.1371/journal.pone.0094212. Immunohistochemical localization of podocyte proteins in kidney tissues. The tissues were prepared with IVCT and immersion-fixation methods under various hemodynamic conditions. The micrographs of A, B, C, and D show the localization of integrin β1; F, G, H and I exhibit control stainings ommitting the integrin β1 primary antibody. Immunohistochemical localizations are shown under normotensive condition (A), acute hypertensive condition (B), and cardiac arrest condition (C). The tissue in D was treated by the immersion-fixation method. Scale bars = 20 μm. Immunohistochemistry (Formalin/PFA-fixed paraffin-embedded sections) - Anti-Integrin beta 1 antibody [P5D2] (ab24693)Image from Yuan X et al., PLoS One. 2014;9(4):e94212. Fig 3.; doi: 10.1371/journal.pone.0094212. Confocal laser scanning micrographs show the double-fluorescence of integrin β1-WT1. The double-staining micrographs are shown in L, O, and R (integrin β1 and WT1, arrows). Both of them were distributed in erythrocytes (asterisk). Left bottom pictures are the manified micrographs. Scale bars = 20 μm. Electron Microscopy - Anti-Integrin beta 1 antibody [P5D2] (ab24693)Image from Yuan X et al., PLoS One. 2014;9(4):e94212. Fig 4.; doi: 10.1371/journal.pone.0094212. Immune electron micrographs of integrin β1 in glomeruli under normotensive and acute hypertensive conditions. Under normotensive condition, the foot processes of podocytes were shown to be shrunken with the conventional fixation method (F). In contrast, using IVCT, the foot processes tightly approached each other and became flatter, integrin β1 was distributed on the basolateral membrane of podocytes (D). In contrast, under hypertensive condition, integrin β1 attached along the basal membrane only (E). Left bottom pictures are the manified micrographs. They were magnified 10 K. (Magnification, ×6000 for D; ×4000 for E; ×10 K for F). Publishing research using ab24693? Please let us know so that we can cite the reference in this datasheet.